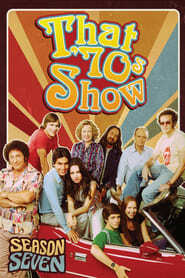 The seventh season of That ’70s Show, an American television series, began September 8, 2004, and ended on May 18, 2005. It aired on Fox. The region 1 DVD was released on October 16, 2007. This season is set entirely in 1979. This is the last season to feature Topher Grace and Ashton Kutcher as regulars. Grace leaves the show at the end of the season to star in Spider-Man 3, and Kutcher to star in The Guardian. However, Kutcher appears five times in the next season as a “Special Guest Star”, and Grace makes an uncredited cameo in the series finale. Note: All episodes are named after songs by The Rolling Stones.